Denver Nuggets point guard Isaiah Thomas, a Tacoma native, shares why he thinks basketball is so special in Washington state. Editor's note: This article was originally published in The Player's Tribune. Basketball and the state of Washington. Those are two things that have defined my life. But really it’s one thing. It’s Washington basketball. From my hometown of Tacoma, to Seattle, where our NBA team was based, we’ve built our own unique basketball culture here. What makes it so unique? Man, it’s hard to explain. It’s more like…. I don’t know, it’s more of a vibe. It’s more like one of those situations where, If you know, you know. 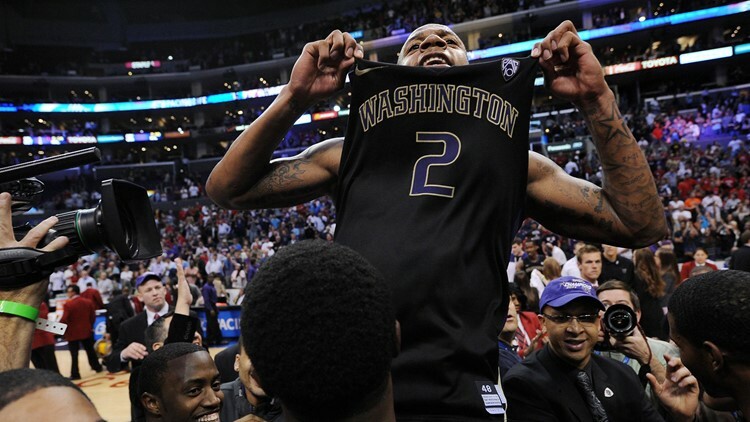 But I still want to do my best to try and break down why Washington hoops is so special. Every summer since I was a rookie, I’ve been coming back, and I’m back here now — back to this place that shaped my journey. I played AAU ball here, high school ball here and then three years for the Huskies. Since I’ve been in the league, I’ve been coming back here for camps and clinics and open runs. And whenever I come back, all kinds of memories rush in, and they remind me of all the ways that this state is in my blood. This summer, I’ve been thinking a lot about one recent memory. It was the chance to go to the All-Star Game with my two boys. Alright, so I’ve got sons — you may already know that part. They’re big hoop heads, no surprise there. But as they grow up a bit, they’re getting bolder about their hoops knowledge. They’re starting to think they already know everything about the game. And they’re six and seven years old….. so what do you really expect? Sometimes it drives me nuts, but it’s cute. So I’m always keeping in mind, as a dad and as a student of the game myself, to let them learn on their own — but also expose them to what they don’t know about basketball. That’s a big reason I was looking forward to taking them to the All-Star Game — to give them a chance to be around some of the best hoopers on the planet. When I was young like my sons are now, and I was growing up near Seattle, I didn’t get to go to very many big basketball games. But some of my best memories are of a few Sonics games my dad took me to. I remember when the Lakers came to play the Sonics in maybe 1997 — I begged my dad to go because I was a brainwashed Lakers fan at the time. My dad took me, and we got to KeyArena real early to see warm-ups. I was around eight years old and I had one go-to outfit, so of course I rocked it: a yellow Lakers warm-up jacket and purple breakaway sweats. It was all larger than life for me. I remember the seats filling up and trying to push through adults to see the players run out of the tunnel, and I almost got close enough to high-five Gary Payton. After the game, we waited around to watch the players drive away from the arena. I was still wired after we got home, with all those sights and sounds running through my head. I was imagining myself running out of that tunnel one day. So taking my sons to a game — an All-Star Game, no less — it was like everything coming full circle. Driving to the arena, I remember looking back through the rearview mirror — and I had one of those Dad Moments, you know? I was proud and I was so grateful to get to experience this with them. As a dad, you’re just trying to take a mental picture of everything while it’s still going on. You’re trying to hold on to how it feels. Then something happened that I didn’t expect. I was asking my boys about the game — if they were excited, what they were looking forward to, stuff like that. For a second, I was about to come back at them with some kind of long-winded answer — you know, just try to make it this teaching moment, right there in the car. But we were pulling up to the parking lot by then, so instead I just told them to wait. You’ll see. Hold up. Hold up — did you think we were going to the NBA All-Star Game? Nah. We was at the WNBA All-Star Game, hosted this summer in Seattle. As a parent, you love to see your kids interacting in all new environments, and learning on the spot. 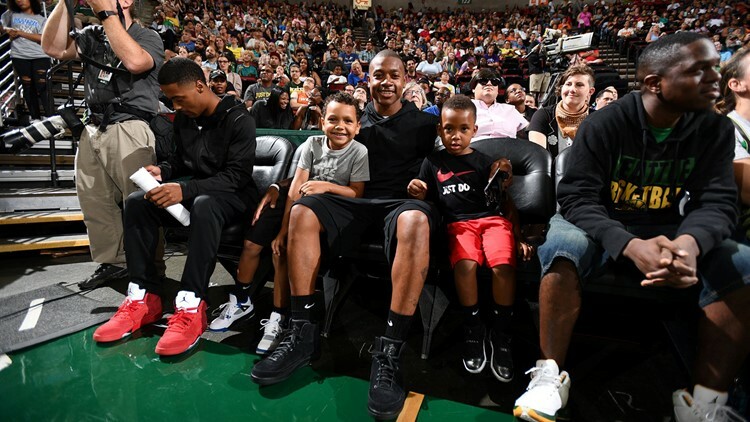 So seeing my boys on the KeyArena court for the warm-ups at the WNBA All-Star Game — that was special for me. They were loving every minute. We got there early, and they got to be right down on court level, almost rubbing shoulders with the players. The buzz was crazy. The place was packed. I was taking it all in myself — saying what’s up to some of these players in the W who I’m cool with. We’ll go back and forth about hoops and life and everything, like any colleagues would. But mostly when I’m at a WNBA game, I’m just enjoying being a fan. I remember looking up to the rafters in KeyArena, where the 1979 Sonics championship banner would hang — and it’s cool because it’s still that very same building where I went to games as a kid. But now there are two new banners in its place, for the two titles that Seattle has won since then. The Storm in 2004, and the Storm in 2010. The Seattle Storm is back in the WNBA Playoffs this year, and that’s another big reason, I think, that Washington basketball is on my mind. Washington basketball, this culture…. in Seattle, man, we ride for the Storm. The city has been filling KeyArena for years, before and after the Sonics left, so nobody has to worry about whether the city’s gonna come out for our games. We ready. We want another ’ship. The Storm’s gonna be on in our house, and if we make the Finals I’m gonna try to go to at least one game. They’re talking about how the Sonics are gone. I get that. But I can’t help but hear something else, too: They’re forgetting about the Storm. Seattle…. it still has pro hoops. The Storm has been here for more than two decades. They’re a damn good, consistently-winning, title-taking, pro hoops team. If you don’t see it, that’s on you. You’re just not looking. Here’s the bottom line — and I say this as still that same kid who reps Washington above all else: The Storm is the number-one basketball team that matters in Seattle. Believe me, that’s not trying to knock the Sonics. I love the Sonics as much as anyone who’s from this state. I want them back. I believe they’ll be back someday, and I’ll do whatever I can to support that. But facts are facts. Game must recognize game. And the Sonics haven’t played a game here for a decade. The last time they made it out the first round of the playoffs was 2005. And their only title was in 1979. 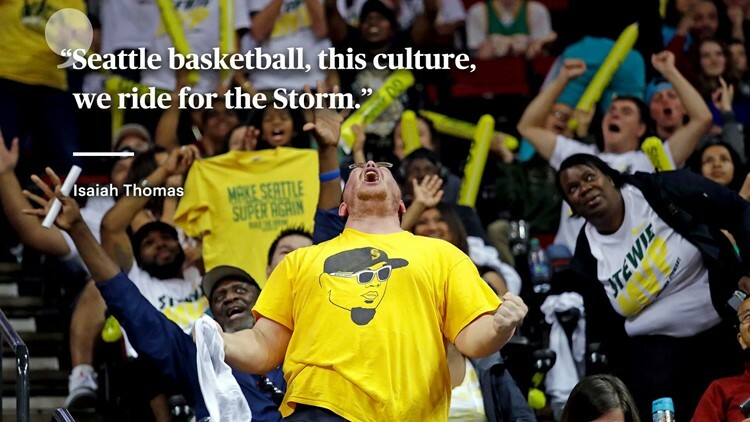 The Storm is Seattle basketball royalty — and you can put that on a T-shirt. It’s facts. So when I see people overlooking, or flat-out not recognizing, the Storm as Seattle’s elite pro hoops team, it gets me fired up. Because that’s a mindset that’s about more than just the Storm as one team. It’s a disrespect for the entire game of women’s basketball — and it’s a problem that I feel like we shouldn’t ignore. To put it really simple: If you don’t respect women’s basketball, you’re a joke. I mean, just think of it this way: If you don’t want the sport of basketball to be the best it can be, are you even a real basketball fan? Personally, I don’t think so. That’s calling it how I see it. And the way I see it is — I’m not even about convincing people how important the WNBA is anymore. I’m not even about that. Because real heads know. They know that either you can appreciate the WNBA, and either you’re cool with the WNBA, or I’m sorry to say it but the truth is: You’re not someone who deserves a seat at the table of this conversation. Because if you’re not about giving these women a chance, then you don’t truly love basketball. So that’s my main thing, really. NBA, WNBA, whatever — let’s just all of us love this great game together. Let’s all of us support this great game together. Let’s have this be one hoop community, period. And as far as what we can do to help this situation — I think the first thing we can do is support each other’s leagues. More and more, you’re seeing, we do. I love it how the NBA’s best players, everyone from LeBron to Kyrie to Kobe and others, are showing up courtside at WNBA games, and tweeting about games in real time. I love it, in Seattle, how at any given game you’re gonna be seeing Jamal Crawford or Richard Sherman or Kam Chancellor or Nate Robinson in the mix. Bill Gates and Steve Ballmer show up all the time. The bottom line is that there’s starting to be more support. It’s pros supporting pros. That’s a sign of respect, and it’s a good place to start. We have to do whatever we can to make sure the WNBA is out there for the world to see. We also need to move the game to the next level by demanding more exposure for it. I guarantee that exposure of the game will lead to more interest, more money, more opportunities for young women to go after their hoop dreams, and a better game overall. So when people say there’s not a market for the WNBA, I think we need to respond by saying: We can make a market. If there’s a will, there’s a way. And then lastly, man — yeah, I’ll say it: We’ve also gotta make more noise about WNBA salaries. Way more noise. WNBA players should be paid a lot more than they’re getting right now. That’s obvious. They’re professional athletes and role models and the best in the world at what they do — they should be paid like it. Better salaries are there if we want them to be. So let’s speak up about that. You know, I’ve always been the little guy. My whole life. If you took a time machine back to every stage of my career — I’m talking youth basketball to college recruiting to the NBA — I’ve always had to prove and re-prove that I love this game as much as anyone else. To prove I belonged. I learned that basketball is a slow grind. It’s a marathon. But if you can ball, I told myself, there’ll always be a spot for you. To be honest, that’s still my mantra today. I’m not saying I know close to what it’s like to be a female basketball player trying to get the respect you deserve for how you play — I’ve had a lot of good fortune in basketball just because men’s basketball has better infrastructure, more support, better resources, more publicity. But what I do know, and can say for sure, is this: If you give someone a chance? You’ll be surprised by the heights they can reach. In conclusion, shout out to some dude on Twitter right now who probably thinks he could last three minutes against Diana Taurasi in a game of one-on-one. And man — let’s go Storm. Let’s bring this title home.